In his inaugural outing, GoldenEye, Pierce Brosnan’s Bond is relaxing in the pool of his St. Petersburg hotel when he is cornered by the alluring assassin Xenia Onatopp (Famke Janssen). Bond gets the upper hand – among other parts – and convinces Xenia to introduce him to the mysterious syndicate behind the disappearance of a missing satellite. Of course, the syndicate’s leader is Bond’s old chum Alec Trevelyan (Sean Bean), formerly agent 006 of the British secret service. The erstwhile 006 has always been two steps ahead of 007 and entraps our hero to meet a deadly fate alongside the missing satellite’s programmer, Natalya Simonova (Izabella Scorupco). Luckily, Bond and Natalya prove to be a skillful escape team, evading Trevelyan’s many traps with the help of a luxury watch, a belt, and a Russian T-55 tank. 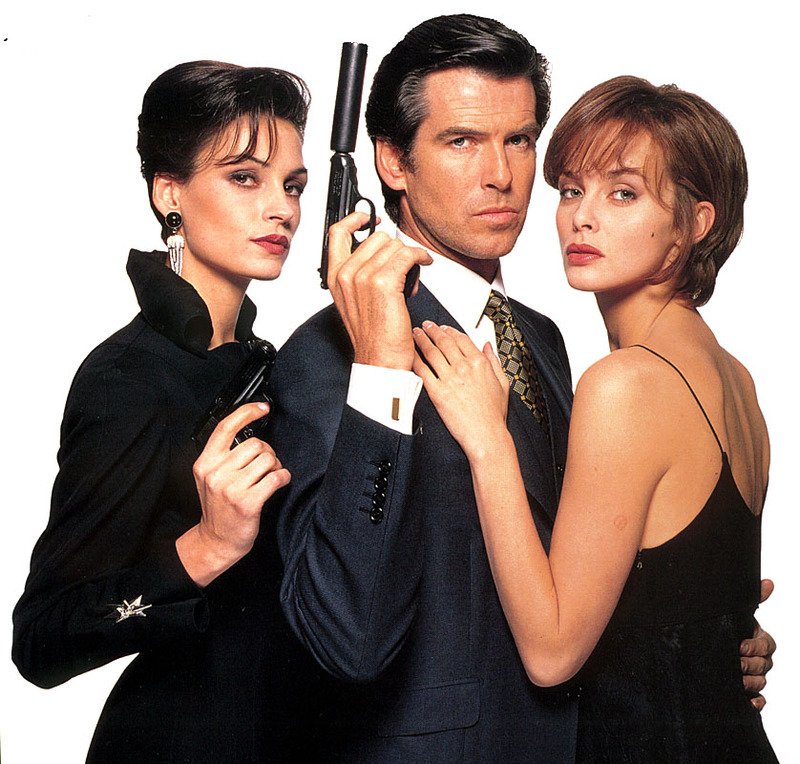 Pierce Brosnan wearing the navy birdseye Brioni three-piece suit, flanked by co-stars Famke Janssen and Izabella Scorupco. Note the addition of the waistcoat and gold cufflinks, neither of which showed up on screen. Pierce Brosnan looks as though he was born wearing a three-piece suit, and his take on James Bond was one of the most suit-heavy tenures in the 007 franchise. 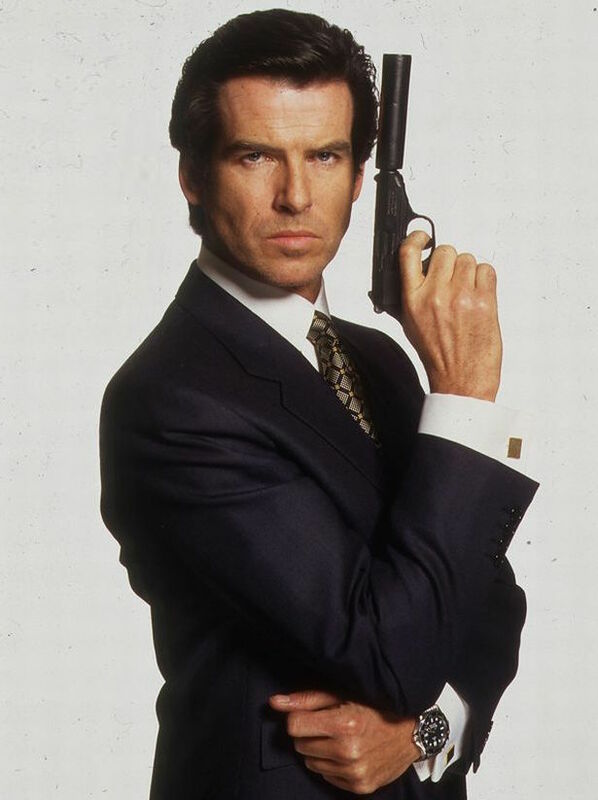 In addition to some of the film’s most prominent and memorable action sequences, this navy worsted Brioni suit also featured in much of GoldenEye‘s promotional artwork. Though it appears solid navy from a distance, the suiting is actually a small-scaled blue-on-navy birdseye weave. Esquire‘s supremely entertaining The Handbook of Style mentions the birdseye weave as one of the nine suiting patterns that men should know, describing it as optimal for “cocktail suits that women always seem to notice.” If these promotional photos of Pierce Brosnan are any indication, they’re right on the money. Under the auspices of costume designer Lindy Hemming, this Brioni suit blends elements of classic Italian and English tailoring and style to create a suit perfect for Brosnan’s stylish 007. The cut is full and flattering with straight, padded Italian shoulders joining British details like the functional “surgeon’s cuffs”, double vents, and gently tapered waist. Brosnan wears the single-breasted suit jacket unbuttoned throughout these scenes, often revealing Brioni’s typical Bemberg rayon lining on the inside. The jacket has notch lapels that roll to a low and close three-button front. Bond stands among the ruins of Russia’s Soviet past…perhaps an indication of many audience’s concerns about the franchise itself. The jacket has slightly flapped hip pockets and a ticket pocket – yet another traditional British element. In the jacket’s welted breast pocket, Brosnan wears the blue silk puffed pocket square that adorned all three of his business suits in GoldenEye, although it contrasted more against his Glen plaid suit and his charcoal windowpane suit. The color is an interesting choice as blue-on-blue may get lost among the suiting, but it adds a subtle touch of luxury that also calls out the blue in the suit and the deep navy tie. 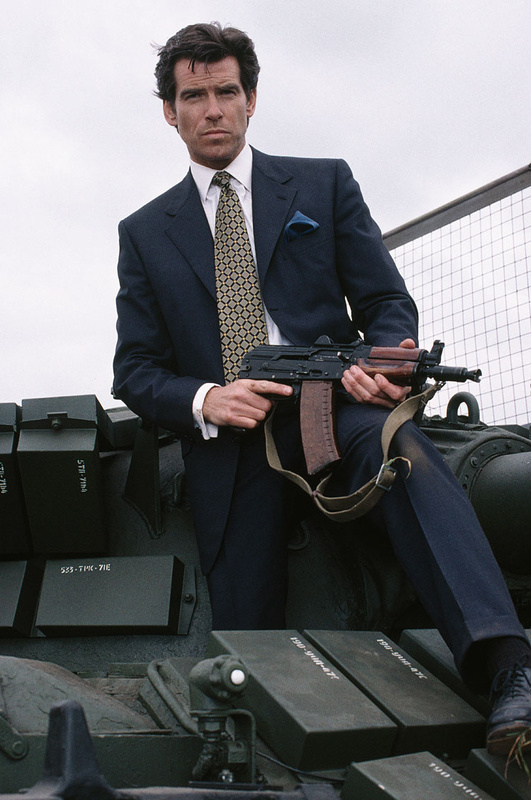 The navy birdseye suit is one of three wool business suits that Lindy Hemming had commissioned for Brosnan to wear in GoldenEye. All were three-piece suits with matching waistcoats, but only the charcoal windowpane suit made use of the waistcoat on screen. However, the navy suit’s waistcoat didn’t go totally to waste (or waist, ha), as much of the film’s promotional artwork features the full suit. Brosnan was also photographed with the cast and crew while wearing the same suit, complete with the six-button waistcoat, during the GoldenEye launch press conference in London in January 1995. 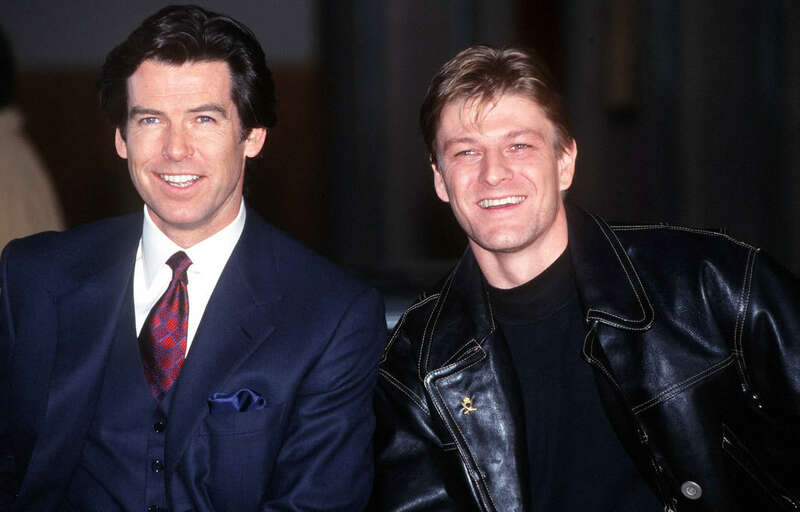 Pierce Brosnan and Sean Bean smiling for reporters in January 1995. Note that, despite the different tie and plain white shirt, Brosnan wears the same blue silk puffed display kerchief that he would wear on screen as Bond. As seen in the presser photos and the auction listing, the vest appears to have two welted lower pockets and a notched bottom as well as the Bamberg “silk effect” rayon lining across the back. The suit includes matching trousers with a medium rise that perfectly meets the blade of Brosnan’s tie at his natural waist. They are double reverse-pleated with side pockets and slightly tapered legs down to the bottoms, which are finished with cuffs. That train explosion might have really damaged Bond’s suit! Luckily, he and Natalya escape without a scratch…and without even loosening Bond’s tie. “A typical leather belt… male, size 34 buckle, notch,” is Q’s description for the black leather belt that Bond wears with his suit. The belt has a gold-toned brass single-prong buckle, but that’s hardly its most compelling feature as it also includes a piton device that helps him out of a jam when Russian troops corner him in the archives room of a St. Petersburg military facility. Of course. The maker of the belt is currently unknown, but there is some speculation that it is a Dunhill belt as Dunhill provided belts for Brosnan to wear in The World is Not Enough and possibly Tomorrow Never Dies. While the belt maker may be a mystery, there’s no doubt that all of Brosnan’s dress shirts in GoldenEye were made by Sulka, the venerated shirt-maker that closed its final shop in 2002. Anne-Marie Shiro wrote in the New York Times in 1985 that “Nothing from Sulka ever goes out of style,” and Brosnan’s shirts here are no exception. With this navy birdseye suit, he wears a pale cream poplin shirt with a classic semi-spread collar, front placket, and squared double (French) cuffs, secured by textured gunmetal links with rounded corners. This Uber ride would surely warrant less than 5 stars. Ah, the divisive ties of the Brosnan Bond era. While some fans welcome the complexity of Brosnan’s patterned ties, others yearn for the understated simplicity of Connery’s grenadine ties. The woven silk Sulka tie that Brosnan wore during this sequence appears to be a geometric pattern of old gold diamonds on a dark navy grid with smaller yellow gold squares at each corner. A closer look reveals that each old gold diamond consists of 36-dot squares, turned 90°, and that each smaller yellow square is a 9-dot square. Bond seems to spend most of his time in GoldenEye next to frustrated women. The Church’s association with James Bond began with GoldenEye, with Pierce Brosnan stepping around in a pair of brown leather Chetwynd brogues and, as seen here, a pair of black calf Diplomat semi-brogue oxfords that was auctioned by Christie’s for $1,932 in December 2007. More than two decades later, the Church’s Diplomat semi-brogues are still available from the Church’s site for €620, albeit with five lace eyelets rather than the six-eyelet models as worn by Brosnan in 1995. To learn more about the Church’s Diplomat and its appearances in the Bond franchise, check out James Bond Lifestyle. Brosnan wears a pair of navy blue ribbed dress socks, just a shade lighter than his suit. GoldenEye provided the lone appearance of Bond’s Omega Seamaster Professional 2541.80.00, but it certainly makes good use of the timepiece, which has evidently been modified by Q Branch with Live and Let Die-style laser cutting technology. Although they may not have lasers, a Bond-like Omega can be yours for just shy of $2,000, thanks to eBay. Bond’s Omega has a stainless steel 41mm case, blue dial, and blue rotating bezel. It is powered by Omega’s 1538 Quartz precision movement and is the only quartz-powered Omega that 007 wears before Brosnan switched to the 2531 chronometer with an automatic movement for his duration in the series. More details can be found at James Bond Lifestyle. As of March 2017, neither iPhone nor Android have a comparable app to Bond’s laser-cutter. Omega for the win. More information about this outfit and a nice illustration and description of the birdseye weave can be found at The Suits of James Bond. Pierce Brosnan wears the Brioni suit with the Sulka shirt and tie in a promotional photo, armed with Bond’s trademark Walther PPK and silencer. Though he wears flat gold cuff links here, he would wear a dark gunmetal pair on screen. Bond’s navy birdseye suit ensemble in Russia is one of my favorite outfits in the series and was well-featured during some of the most iconic action sequences of the modern 007 era. The cinematic landscape had changed plenty during the six-year gap of Bond films from 1989 to 1995. Action movies had evolved into exposition for major gunfights featuring the latest automatic weapons. Sure, it’s part of the exaggerated violence that saturated ’90s action cinema, but it’s fun as hell to watch. From the opening sequence in the Arkangel weapons facility to the Cuban-set finale, the first 007 for the FPS generation minds himself making greater use of weapons picked up from downed enemies; in this case, those weapons are almost exclusively AKS-74U assault carbines. The origins of the AKS-74U can be traced all the way back to the later months of World War II as Soviet Russia was developing the first modern assault rifle, inspired by the Sturmgewehr 44 that was wielded by Hitler’s troops fighting on the Eastern front. Weapons designer Mikhail Kalashnikov built his prototypes around the new 7.62x39mm M43 cartridge, and the AK-47 (Avtomat Kalashnikova) was quickly adopted for Soviet service and production began in 1949. “AK-47” has incorrectly become a colloquial catch-all for any similar weapon based on or incorporating Kalashnikov’s original design, including – but not limited to – the AKM variant, the Chinese Norinco Type 56, Egyptian Maadi ARM copies, the Romanian AIM/AIMS, and Yugoslavian Zastova rifles. As the design continued to evolve through the decades, Kalashnikov oversaw development of the AK-74, adapting his original rifle for the high velocity 5.45x39mm cartridge. As its nomenclature indicates, production began in 1974 with the first real military action later that decade for Soviet conflicts in Afghanistan. The AKS-74U was the result of a design competition for a fully automatic carbine to be easily stored and carried as personal defense weapons. Introduced in 1979, the AKS-74U incorporated the side-folding stock from the AKS-74 with a shortened “U” (for Ukorochenniy) barrel, creating a compact and deadly selective-fire carbine for close quarters. Note the short barrel with its muzzle flash suppressor and the side-folding stock, making this a very portable weapon for Bond to easily transfer in and out of a tank. Weighing in at six pounds with an 8.3-inch barrel, the AKS-74U offers portability in addition to a high capacity for its accurate 5.45x39mm cartridge, fed from a standard 30-round box magazine with expanded feeding capabilities up to a 100-round drum, making it a practical choice for the close-quarters combat that Bond finds himself in throughout GoldenEye. The folding stock reduces the overall length from 28.9 inches to 19.3 inches when folded. As the AKS-74U remains in the service of the Russian Federation’s armed forces, as well as many other Eastern European countries and those of the former Soviet Bloc, it makes sense that Bond would pick his up from the hands of Russian soldiers. In GoldenEye 007, the N64 game that revolutionized FPS in the late ’90s, the many AKS-74 rifles (or modified Norinco Type 56-1 rifles) seen on screen are given the “KF7 Soviet” nomenclature. You can read more at IMFDB about the weaponry used in GoldenEye and GoldenEye 007. That’s the trouble with the world today; no one takes the time to do a really sinister interrogation anymore. It’s a lost art. Brosnan weighed in at the time of Goldeneye’s release at a lean and light 75 kgs (164 pounds). The lightest he weighed as Bond, people have said recently that he looked skinny, but Bond isn’t surposed to be a bodybuilder. Brosnan was fit and toned which is more important then being muscle bound. But the Brioni cut really flattered Brosnan’s figure at the time, the full cut through the body and padded shoulders gave him a bit more of an imposing look. Cool idea! Any particular looks from that show that you’d like to see?